Shared with us from Gary at Unsealed.Org. LAST UPDATED: June 7th, 2017. By now you’ve probably heard about what a number of Christians are calling the Revelation 12 Sign that will supposedly occur on Saturday, September 23rd, 2017. There is a lot of rampant speculation on the internet both for and against the legitimacy of this sign and much information to weed through. What’s true? What’s false? Is this all hype? The goal of this article is to provide readers with a comprehensive and straightforward analysis of the purported sign, addressing many questions and concerns. The three sections below cover the sign itself, it’s possible significance, and claims and critiques about the sign. I suspect this article will be updated as new information is uncovered, so please feel free to add items of interest in the Comments below. The astronomical alignment that so many are now pointing to comes from a literal reading of Revelation 12:1-5, which describes a sign in the sky involving a woman who is crowned with twelve stars, clothed with the sun, having the moon under her feet, and giving birth to a male child. The text itself does not describe the sign as a parable or illustration, which validates the view that this passage is in fact describing a real astronomical event visible to the inhabitants of the earth – complete with real sun, moon, and stars. Each of the elements described in the sign have significant prophetic and allegorical meaning as will be shown, but the passage itself describes first and foremost a real sign and so any accurate interpretation must begin with that premise. Lacking any evidence that the Apostle John was not describing a sign visible in the sky as the text plainly says, the burden of proof is entirely upon those who would argue that this passage is only pure allegory. There has been much confusion over both the Hebrew and Greek words for heaven. In the Greek, the word in Revelation 12:1 is ourano with a definite article, which can be translated as “in heaven” or “in the sky.” The distinction is a big deal, because many who deny a literal one thousand-year kingdom of Christ and the earthly fulfillment of Old Testament covenant promises, will opt for “heaven” being the translation every time. The same goes for Revelation 21:1. John sees what is often translated “a new heaven” and “a new earth.” However, it may be better to translate this as “a new sky,” rather than confusing modern readers by using a word in modern English most often associated with God’s dwelling. It is also important to note that these first five verses in Revelation 12 purposefully distinguish between two different signs. The first sign, which the text calls “a great sign”, involves only a woman in labor, and so includes Revelation 12:1-2 and Revelation 12:5. The second sign, called “another sign”, is described in Revelation 12:3-4. The signs are connected in the narrative, but their distinction tells us that they are not the same and this is the likely reason that only the first sign has been apparently identified in the Fall of 2017. A number of different explanations for the second sign have been offered, such as an as of yet unseen stellar or planetary body, but that is not the topic of this study. Our focus is entirely on the “great sign”. Virgo, Latin for “virgin” or “maiden”, is the second largest constellation in the sky and one of the twelve constellations of the Zodiac and Jewish Mazzaroth (the constellations that the sun appears to move through during the course of the year). In most depictions it features twelve principal stars as can be seen in the picture above. 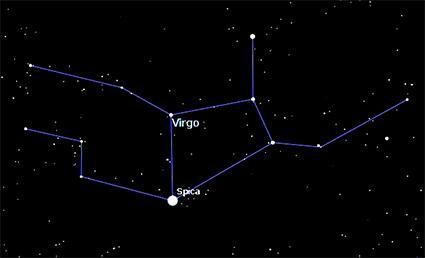 Spica, along with three other stars, forms a womb-of-sorts at the center of the constellation. Virgo is universally depicted as a woman, even in the ancient Grecian, Roman, and Assyrian-Babylonian cultures and for this reason it is argued that this is the “woman” John saw in the sky. It is the only constellation in the Zodiac and Mazzaroth that represents a woman, and out of the 88 constellations in the entire celestial sphere, it is one of only three constellations that represent women (the other two being Andromeda and Cassiopeia). Our solar system’s star is mentioned by name in Revelation 12:1 as part of the sign. It is said to “clothe” the woman. From the perspective of a viewer on earth, the sun is always much smaller than Virgo and therefore it cannot be the disc of the sun itself that clothes her in any arrangement, but on September 23rd it will rest upon her shoulder and the sign will be entirely “clothed” in sunlight during the day on September 22nd and 23rd, hiding Virgo from view. The lunar body is also mentioned by name in Revelation 12:1, described as residing under the woman’s feet. On September 23rd, from the perspective of a viewer in the Middle East, Virgo will appear prone and the moon will appear directly under the feet of the constellation. It is not uncommon for Virgo to be “clothed” in the sun and to have the moon under or near her feet – in fact it happens every year for a number of days in the Fall. It is the crown of twelve stars that John saw that really begins to set this sign apart. This is far, far more rare. The Hebrew and Greek words for “star” do not distinguish between stars as we know them today and planets. From the perspective of an earth-based observer, stars and planets look the same except that planets appear to move through the field of fixed stars. For this reason, planets were sometimes described in the ancient languages as “wandering”, but they were still called stars. Situated directly above the head of the constellation Virgo is the constellation Leo (“The Lion”), composed of nine principal stars as shown above. On September 22nd and 23rd the visible planetsMercury, Mars, and Venus will join Leo’s nine stars to form a “crown” of twelve stars on the head of Virgo. First of all, almost all commentaries on Revelation 12 throughout Church history have identified the male child in the passage with Jesus Christ (though not only Jesus Christ as will be discussed later). It seems obvious enough: on one level the woman represents Mary, the baby is Jesus, and the dragon in the second sign represents satan. The child is “caught up” to God’s throne in the passage and Jesus ascended into Heaven. Jesus will also rule all the nations when He returns as the passage describes the child as doing. A number of theories about the Star of Bethlehem have posited that Jupiter was that very star – Christ’s star. 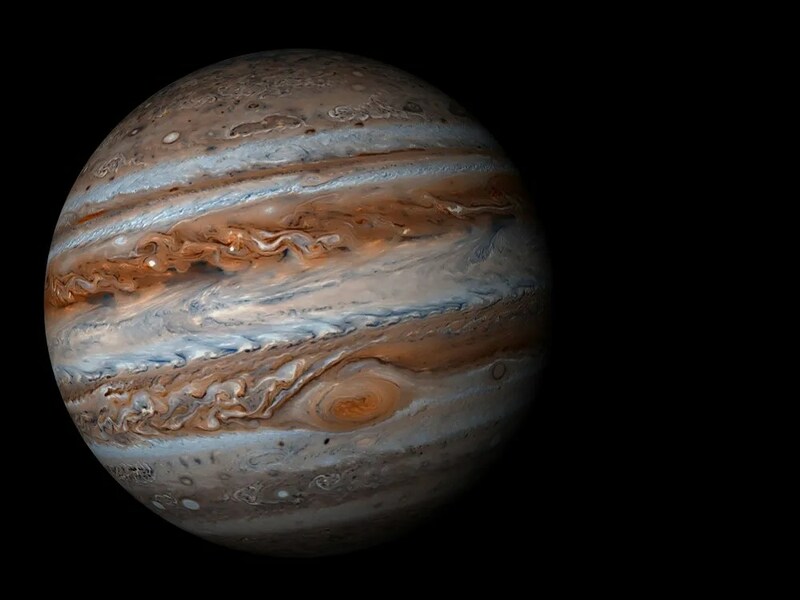 Like Christ, Jupiter is covered in stripes (Isaiah 53:5) and has a very prominent hole called the Great Red Spot, similar to Christ’s spear wound (John 19:34). Also like Christ, Jupiter “takes the blow” for us (Isaiah 53:4-6), absorbing most of the lethal comets and asteroids from the outer solar system that would otherwise strike earth. Second, the planet is named after the king of the gods in the ancient Roman and Greek pantheons (Jupiter and Zeus, respectively). In ancient Babylonian and Germanic pantheons the planet represented the son of their respective chief deities: Marduk son of Ea, and Thor son of Odin. In other words, in the ancient world Jupiter was always associated with either the greatest male deity or that deity’s son. Jupiter is therefore frequently called the “king planet”. Third, on November 20th, 2016, the planet Jupiter entered the womb of the constellation Virgo where it will remain for exactly 42 weeks, the precise length of a long human gestation. The 42 week gestation is interesting in light of the 42 generations from Abraham to Christ (Matthew 1:17) and the 42 months that transpire in each of the first and second halves of the Tribulation (Revelation 11:2, Revelation 13:5, Daniel 7:25, among others). A crown of twelve stars above Virgo’s head is rare, but this is rarer still. In order for Jupiter to remain in the womb for such a lengthy and precise amount of time, it undergoes an extremely rare retrograde motion in the constellation. The planet actually appears to make a giant circle within the womb during this time before exiting on September 9th, 2017. The sign in Revelation 12 completes in verse 5 after the child is born and likewise two weeks after Jupiter exits the womb, it moves down the celestial birthing canal and the complete sign is formed in the sky. It could be said that the woman is in labor for two weeks as the baby moves out of the womb and through the canal. Revelation 12:14-16, 6: The Jewish remnant’s protection and provision while the remaining three and one-half years of the Tribulation comes to a conclusion. Corporately, however, the woman represents Israel. This is indicated not only by the very Jewishness of a crown of twelve stars (the twelve tribes of Israel per Genesis 37:9-10), but by the narrative overall. The woman is the one protected in the wilderness on earth and a key distinction is made between her and her offspring (first the male child and second her other offspring in verse 17). Some have argued that the woman represents the Church, but this position is untenable because the Church didn’t give birth to Christ. For these three reasons, virtually all dispensationalists and even many covenant theologians associate the woman with Israel. Corporately, it is straightforward to understand that the dragon represents the antichrist and his kingdom, because it is through the kingdom of antichrist that the dragon actually persecutes Israel and the future Tribulation Saints. 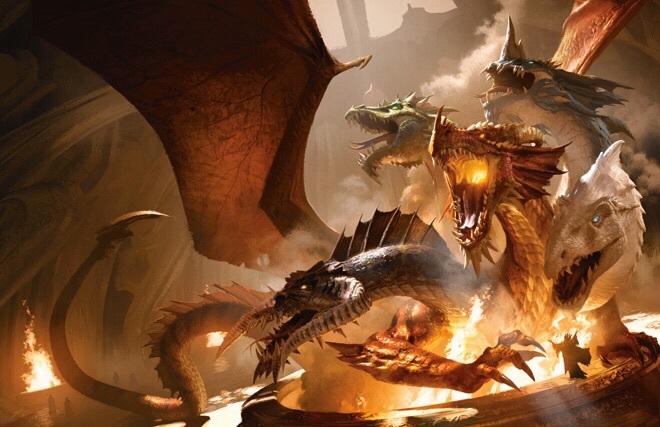 This corporate understanding is further proven by the dragon’s seven heads and ten horns, which are connected to the antichrist’s dominion (Revelation 17:9) and the world rulers who will give him his authority (Revelation 17:12, Daniel 7:20-22). In summary, the significance of the Revelation 12 sign may be the rapture of the Church, the beginning of the cosmic war in Heaven, and God’s redemptive focus returning to Israel and the Jews (Micah 5:3). The Revelation 12 sign on September 23rd, 2017, also happens to fall on what will likely be the first or second day of Rosh Hashanah, determined by the sighting of the new moon. This could be incredibly significant because for many years students of Bible prophecy have speculated that Rosh Hashanah (also called Yom Teruah or “The Feast of Trumpets”) is the most likely time of year for the rapture. The very next feast in chronological order is The Feast of Trumpets, which happens to fall on September 22nd and 23rd in 2017 – when the possible sign occurs. CLAIM: Looking for “signs” in the sky is astrology. The Bible explicitly says that there will be signs in the sky preceding the return of Christ (Matthew 24:30, Luke 21:11, Luke 21:25, Revelation 12:1-3). The Bible also says that the sun, moon, and stars were created for three reasons: 1. To separate day from night, 2. To give light to the earth, and 3. To indicate days, years, seasons, and signs (Genesis 1:14-15). Prophetic language frequently makes mention of lunar and solar eclipses (Joel 2:31, Acts 2:20, Revelation 6:12) and God often focuses our attention on the stars (Genesis 15:5, Isaiah 40:26, Job 38:31, Amos 5:8, Psalm 19:1). Interestingly, the magi from the east were able to find the baby Jesus by following prophetic descriptions found in Numbers 24:17 and Genesis 49:9-10. They were able to identify the constellation Leo (“The Lion”) with the tribe of Judah and followed the Star of Bethlehem as it moved west and came to rest over Bethlehem. Adam at the Parable of the Vineyard has a great rebuttal to the claim that the Revelation 12 Sign is astrology. This is also FALSE, with one caveat. Some argue that this sign occurred in 3915 BC, 3 BC, and 70 AD. It definitely did not occur in 3 BC or 70 AD, but it came close to occurring on August 5th of 3915 BC. So the caveat is the 3915 BC occurrence where Saturn was in the crown, but Mars was absent. Jupiter also underwent an approximately nine month retrograde through the womb of Virgo during this time (October 28th, 3916 BC to August 5th, 3915 BC), but a large portion of Jupiter’s retrograde took place outside of the womb. Three separate studies have shown that the September 23rd alignment is a once-in-human-history event. The woman has a crown of twelve stars, but Jupiter and Venus are so close together it makes them hard to distinguish. The sun and moon are in place, but she has no “male child”. The womb is completely empty. You could also argue that the moon is below her knees, not her feet. Many have argued that Rosh Hashanah of 3 BC (September 11th) also featured the sign as evidence Christ was born that day, but this only gets two things right: the sun clothes the woman and the moon is under her feet. There is no crown of twelve stars, the moon is very far away, and she is not giving birth to a “male child”. This is FALSE. I’m not sure who first made the argument that the constellations in question (Virgo and Leo) will not be in the sky above Israel in Fall 2017, but it simply isn’t true. The entire sign will be in the western sky above Israel and Jerusalem on Saturday, September 23rd – and how fitting that the sign that may be heralding the end of the Church Age will be seen right where the sun sets and the day ends. One might argue that observers can’t see the alignment because the sun is up, but that’s exactly what John saw – the woman is clothed with the sun. And, as a matter of fact, after the sun sets, everything but the woman’s crown will be visible in the night sky. CLAIM: The moon is not under the woman’s feet. This is FALSE. When I initially studied the alignment I was misled by images showing the woman standing upright with the moon to the right of her feet. The text makes clear that the moon should be under her feet, not beside her feet. For this reason I viewed the heavenly sign with some skepticism. After all, God’s Word is perfect and for His Word to be fulfilled it must be fulfilled perfectly. Every condition in the text has to be fulfilled, which is why 70 AD, 3 BC, and 3915 BC don’t fit the bill. However, a woman in labor is not standing when she gives birth, she’s lying prone, and that’s exactly how the alignment is arranged in the sky – the woman is lying prone with her feet up and the moon is directly below her feet, almost as a pillow of sorts. This is TRUE. I think we can all agree that the sign John saw had definite symbolic and prophetic meaning – that is not in dispute. However, the text itself makes abundantly clear that this is more than just a parable: “A great sign appeared in heaven…” (Revelation 12:1). I’m not saying the rapture will occur in September 2017, but I am saying that the heavenly sign John saw in Revelation 12 appears to be happening before our very eyes with whatever implications that brings and I believe Jesus will be calling us home very, very soon. John describes a literal astronomical alignment that appears to occur on September 23, 2017. This is either TRUE or FALSE. That might sound like a cop-out answer, but the truth of the matter is, it either will or it won’t. It isn’t a possibility, it’s either for-sure or for-sure-not. Whatever God has planned will happen and I’m committed to not date setting. As a fallen human being, I’m the one prone to intellectual deficiencies and lack of understanding, but God’s Word is true and will stand the test of time. About three weeks after the “great sign” has occurred, Jupiter finally exits all the boundaries of the constellation Virgo – crossing over the boundary between Spica and Algafar I at almost exactly 9:00 PM IST. This area looks somewhat like the belly of a pregnant woman. Could this be the birth foretold in Revelation 12:5? One month after the possible October 13th “birth”, Jupiter comes into an extremely close conjunction with the Morning Star, Venus, separated by less than one-third of a degree. Jesus says that He is the Morning Star in Revelation 22:16 and Rick Larson had previously identified a conjunction of Jupiter and Venus as heralding the birth of Christ. Could this date possibly portray the Church meeting the Lord in the air (1 Thessalonians 4:17) and/or the glorification of the Church when we shall be made like Him (1 John 3:2)? After the October 13th “birth” and the November 13th conjunction, Jupiter continues its trek through the ecliptic and won’t return to Virgo for many years. Jupiter now makes its way to the constellation Libra. An interesting thing to note about Revelation 12:5 is that the male child is “caught up” to God’s throne. The September 23rd event doesn’t portray this catching up in the sky, but only the birth of the child. Should we expect to see the rapture itself portrayed in the sky? I don’t think we necessarily will, but I should point out that after Jupiter is “birthed” from Virgo it travels to the constellation Libra and precisely at midnight in Israel on December 25th, 2017, the male child Jupiter enters Libra where it stays for 41 weeks and three days, undergoing another nine month retrograde. Libra (Latin for “scales”) is associated with justice and judgment and some depictions of the constellation resemble a throne. From the throne of God justice and judgment are given. While everyone is focused on September 23rd, is it possible that the rapture happens on Christmas Day, a little over three months later? After undergoing retrograde Jupiter leaves Libra on October 11th, 2018. I think it is unlikely that the rapture will happen on Christmas Day in 2017 for two reasons: 1. Libra is not categorically associated with a throne – the connection is more tenuous to make, and 2. The December 25th date would not easily fit with any Tribulation timeline where Jesus’ second coming could occur on a Fall feast day. However, I offer it as a possibility and we should all be humble, open, and watchful, so that we are not caught unaware. CLAIM: The woman is not “clothed” with the Sun on September 23rd, 2017. Second, the Greek word for “Sun” in Revelation 12:1 is ἥλιον, transliterated hēlion, which is Strong’s 2246 – hélios. The word can carry several meanings: the Sun, the rays of the sun, sunlight, and daylight. Ancient Greek didn’t have different words for these four meanings as we do in English, so hélios carries other connotations beyond just the literal meaning of “Sun”. The use of the word in the Septuagint with its definite article in 2 Samuel 12:11 is perhaps a good example of this where the idea is “broad daylight” – τοῦ ἡλίου. The Revelation 12 Sign not only appears in its fullness over Israel during the day on September 23rd, but because the Sun is in the area of the constellation, the woman appears fully “clothed” in the Sun’s rays. The image above shows the deepest possible point in the constellation that the Sun traverses (the red line is the Sun’s unchanging path every year). The Sun will never hover over Virgo’s neck or chest, or be centered anywhere in the quadrangle of the constellation’s womb, nor will it ever cover her legs, so “clothed with the Sun” must simply mean that the Sun is passing through the constellation as it does every Fall for a little over one and a half months. You can test this yourself using any astronomy software – whether you choose 3000 BC or 3000 AD makes no difference. It is interesting to note that if you bisect Virgo into two equal parts, the Sun’s position on September 23rd, 2017 is about as close as the Sun ever gets to being perfectly centered over the constellation. “Clothed in the Sun” probably also draws on the connotations mentioned in the second point above, which is that the woman is clothed in sunlight or the rays of the Sun. In September 2017 we see a perfect match with John’s prophecy. CLAIM: The male child of Revelation 12:5 is Jesus, not the corporate Church. First, it is repeated ad infinitum by detractors that the Church is the bride of Christ and thus the man-child cannot represent the Church. This is a very exegetically weak argument for several reasons. For starters, the Church is called a man in Ephesians 2:15. There are a number of metaphors for the Church in Scripture besides a bride. The most common is actually Christ’s body (e.g. 1 Corinthians 10:16-17, 12:12-13, 25-27; Romans 12:4-5; Colossians 1:18, 24, 2:19, 3:15; Ephesians 4:4, 11-13). And what might come as a shock to some, the Church is never explicitly identified as the bride of Christ. The closest you can come to that analogy is in 2 Corinthians 11:2 and Ephesians 5:22-24. In the Ephesians passage the Church is likened to a bride in that that the Church is subject to Christ who is the head, but the Church is not said to actually be the bride. The only explicit reference to Christ’s bride is found in Revelation 21:2, 9-10. The bride is the city of New Jerusalem, which is revealed after the millennial reign of Christ. New Jerusalem has characteristics from both Israel and the Church, with gates named after the sons of Jacob (men who died long before Christ’s first advent), and foundations named after the Twelve Apostles. Zion, which is a prophetic term for heavenly Jerusalem, is likened to a woman in labor in Isaiah 66:8, so in a certain sense it is really Zion, the mother of all the saints both pre- and post-Christ, that is the wife of the Lamb. We need to remember that bride is just one analogy of many for the Church, just as body is. The Church is just as often compared to a temple (1 Corinthians 3:16-17, 6:19; 2 Corinthians 6:16; Ephesians 2:19-22; 1 Peter 2:5). Second, the Apostle John makes a grammatical error in Revelation 12:5 when he modifies the masculine huios (son) with the neuter word arsen. If you believe that God’s Word is infallible, then you’re only left with one option: John made this mistake intentionally. And sure enough, his use of arsen appears to come directly from the Septuagint version of Isaiah 66:7-8 where we see the same imagery of a woman in labor with a male child. Isaiah 66:8 gives the male child an unmistakable corporate identity – he is a nation born in a single day. 1 Peter 2:9 says the Church is a holy nation. Third, Revelation 12:5 says that the male child “will rule all the nations with an iron scepter”. This is an important clue. There is no question that this phrase relates to Christ as can be seen in Psalm 2:9 and Revelation 19:14-15. However, Revelation 2:26-27 unmistakably gives the promise to “rule with an iron scepter” to the Church, as well. There is no way to get around verse 27 – Christ, in union with His Church, will rule the nations with a rod of iron. Fourth, the corporate identity of the male child preserves the symbolic pattern of Revelation 12: the woman is Mary and Israel, the dragon is satan and his kingdom, and the child is Christ and His Church. Fifth, the use of harpazó in Revelation 12:5 is a huge clue. Harpazó is the same word used for “rapture” or “caught up” in 1 Thessalonians 4:17 and means a sudden removal by force. Jesus’ ascension was never once described using this word and in fact the Apostle John himself (the author of Revelation) calls Jesus’ ascension anabainó in John 20:17 – meaning to go up, ascend, or rise. When Jesus ascended to Heaven He had already conquered death and sin. He was in absolutely no danger from anyone. The Bible says He left not to escape satan, but because it was beneficial for the Church (John 16:7). There is simply no way to reconcile the context of Revelation 12:5, which is a sudden snatching away by force from the imminent danger of the dragon, with Jesus’ ascension. Sixth, Revelation 12 is significantly placed right in the middle of the book and is an interlude presenting a broad overview of Christ’s first coming all the way up to the end of the Tribulation: Christ’s birth, the gestation and birth of the Church, the war in Heaven, the rise of antichrist’s kingdom (seven heads and ten horns), Israel being pursued by the dragon during the first-half of the Tribulation (Revelation 12:13), Israel being miraculously protected by God for the last-half of the Tribulation (Revelation 12:14), and even satan’s pursuit of the Tribulation Saints once he realizes he can’t touch the divinely protected Jews (Revelation 12:17). Seventh, I firmly believe that the early Church was dispensational, premillennial, and pretribulational. However, with the rise of Augustinianism, the Church went through a 1,400-year hiatus where prophecy tended to be mistrusted and allegorized. The founders of modern dispensationalism who re-popularized the pre-trib rapture such as Darby and Ironside found Revelation 12:5 to actually be the chief proof-text of the pretribulational rapture of the Church. By the early 1900s, this proof-text was largely forgotten by pre-trib proponents and arguments in favor relied primarily on secondary evidence, which led to the rise of mid-trib, pre-wrath, and post-trib views in the Evangelical churches. I find it fascinating that around the same time the Revelation 12Sign was first spotted using astronomy software (sometime in 2011 or 2012), a number of scholars, such as Michael Svigel, re-discovered the use of Revelation 12:5 as the chief pre-trib proof-text. The timing is impeccable. CLAIM: Virgo already has a crown of twelve stars. This is FALSE. Some detractors are arguing that Virgo already has a crown of twelve stars or that Leo does not have nine stars and therefore the alignment on September 23rd is not unique. Alternatively they may argue that Mercury, Mars, and Venus cannot form part of the crown because they are planets and not stars. Both of these objections fail to hold water. Answering the last objection first, the Bible does not make a distinction between stars and planets. We get our English word planet from the Greek word planētēs, which means “a wanderer” and refers to “wandering stars”. However, this word does not stand alone. It modifies the normative Greek word for “stars”, asteres, and occurs only one time in the Bible in Jude 1:13. This in fact becomes a powerful confirmation of the plausibility of the theory that the nine stars of Leo and the three planets Mercury, Mars, and Venus form the crown, because asteres is the same Greek word used in Revelation 12:1 in regards to the twelve-star crown and Jude 1:13 connects planets directly with stars – the implication being that planets are a type of star (from the biblical perspective). Additionally, we see the planet Venus or Jupiter plainly called a star in Scripture such as in Revelation 2:28 and Revelation 22:16. First of all, Coma Berenices is not on Virgo’s head and Revelation 12:1 says the crown of twelve stars is on her head. Virtually all artwork for the constellation Virgo has her head portrayed near where the sun is in the image above – directly below the “crown” of Leo. Secondly, and most decisively, as you can plainly see above, Coma Berenices has three main stars, not twelve. As a matter of fact, I can’t find a single source saying Coma Berenices has twelve stars. It has three main stars and 44 “minor” stars – definitely not twelve. I encourage you to be extremely watchful this Fall, especially on September 21st to 23rd, October 13th, and November 13th. The rapture occurring around any of these dates would allow for a Second Coming on a Fall feast day in 2024.